NFMT Baltimore 2019 is the place to improve and enhance the facilities team. Whether managers want to know best practices for hiring and motivating employees or the most efficient ways to develop an effective scope of work for service contracts, there’s a session for that. Managers can learn the ways to optimize employee talents, assemble a productive team of internal staff, or better communicate with subordinates. Managers also can task specific team members with gathering needed information for peers back home. With free registration and as many as 13 concurrent sessions during some time slots over the course of the three days, NFMT Baltimore 2019 is a great educational value. Managers who bring one or more team members can divide and conquer when it comes to attending sessions and sharing knowledge. Many attendees use lunch and dinner times to discuss ideas they learned that day and plan tactics for sharing information with their peers back home. Another option is a fee-based extension of the conference experience. For $125, NFMT Membership provides year-long, online access to video presentations of dozens of past NFMT sessions. NFMT Baltimore 2019 includes a range of bonus learning opportunities. For an extra fee, attendees can choose one or two Monday Training Camp workshops. 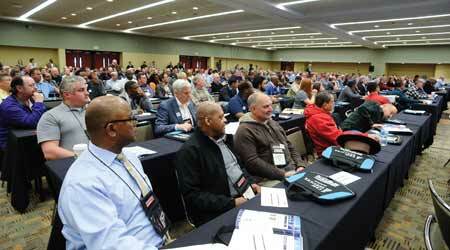 This year’s in-depth topics are career advancement and the ProFM Credential. Also, NFMT conference registration includes free access to the Clean Buildings Expo, an all-new trade show for the commercial cleaning industry. Presented March 26-27, this co-located conference and exposition is geared toward in-house cleaning managers, executive housekeepers, and principals in building service contractor firms working in commercial, government and education facilities. Renee R. Bassett — renee.bassett@gmail.com — is a marketing consultant and writer with Sige Communications, a business-to-business communications firm specializing in content creation and project management. She was previously vice president of content development for Trade Press Media Group and FacilitiesNet.com.